Participate in a free and online conference! We're excited about the fifth annual Global Education Conference, a free week-long online event bringing together educators and innovators from around the world. It will be held Monday, November 17 through Friday, November 21, 2014 with over 200 sessions taking place around the clock in webinar format. Read on for details on how to participate! Join our conference community to receive conference updates. It's a great place to network with other global educators and to share educational resources. The dates for this year's event are November 17-21, 2014 which coincides with International Education Week. The conference takes place entirely online for five days and our community is active year round with continuing conversations and sharing of resources. We encourage you to participate and have volunteers available to help . If you have any questions, please post them in our conference chat on the front page of our community. 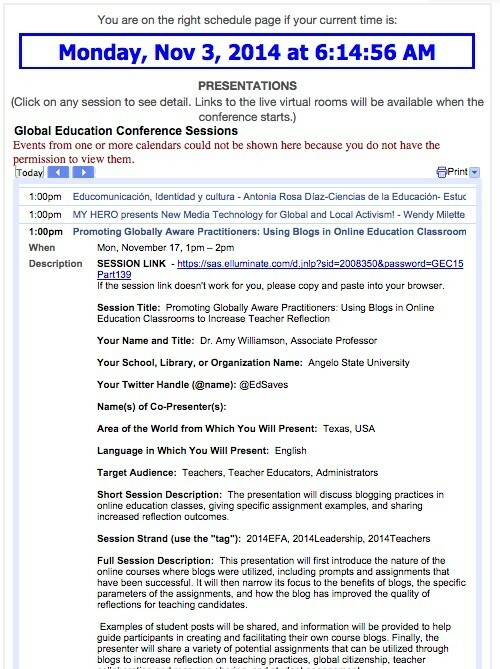 You can also follow the conference backchannel on Twitter using the hashtag #globaled14. The conference schedule is posted on our web site and it is available in your time zone. 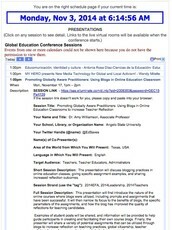 Click on a session title to expand the event. You will see a full description and a link to the virtual room where your particular chosen session will take place. Blackboard Collaborate is the webinar platform for the conference. The sessions are held in BbC webinar rooms called vrooms or virtual rooms. 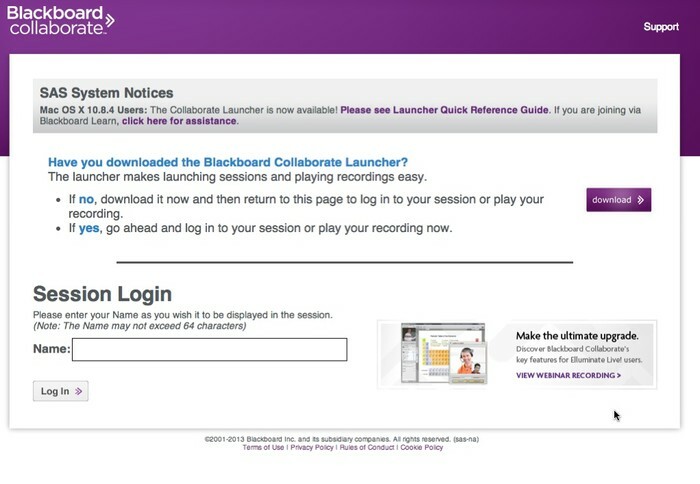 First time users should make sure that their computer is prepared to launch Blackboard Collaborate. Click on a link to a presentation that you would like to attend (around the designated start time) as mentioned in Step 2. 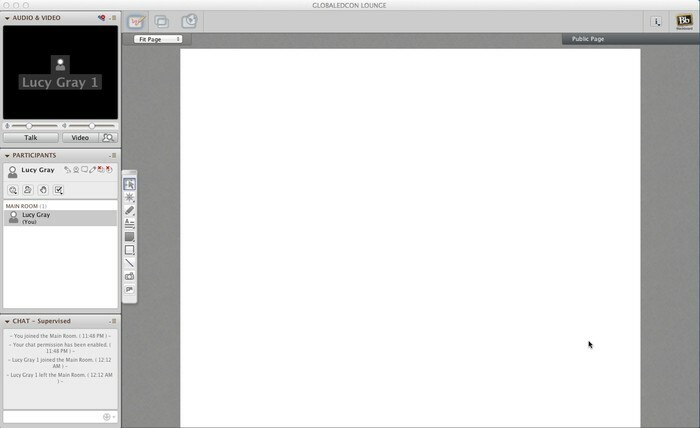 This will launch Blackboard Collaborate. If you are on a Mac, you may have to run an extra launcher application. See this documentation for more information. Enter your name into the Login box and click Login. This process take a minute or two. If you are having technical issues, here are some links to help. Make sure the most recent version of Java is installed on your machine. Now that you've successfully entered a conference session, you can participate and interact with other attendees. There is a chat area where you can introduce yourself, respond to comments and polls, and ask questions while the presentation is going on. The session presenter may see your comments and respond, and there also may be a moderator in the virtual room who may be assisting. Everyone uses this platform a bit differently. Remember, that all sessions are recorded and you will be able to review these recordings shortly after the live event has taken place. They will be posted in our online community indefinitely. Keynote recordings will be uploaded to our YouTube channel. 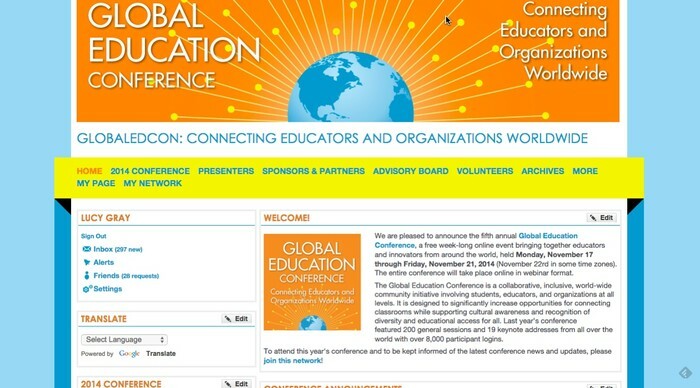 We hope that you find GlobalEdCon to be a valuable experience. Make sure to fill out the conference evaluation form that is pop ups when you exit a Blackboard Collaborate vroom. If you would like to receive one certificate for attending the Global Education Conference, you need to do TWO things. 1) You must submit a request this using this form. This form will not be active until the conference is completed. 2) You must write a blog post reflecting on one of the sessions you attended. Full details about this certificate program are available here. Let's keep the spirit of the conference going year round by continuing conversations in our discussion forum, sharing resources over social media, and inviting fellow community members to projects. View the conference schedule in your own time zone. Find the links to the Blackboard Collaborate webinar rooms where sessions will take place. You can also add conference events to your own calendar as well. Read all about our distinguished invited keynote speakers from around the world. Another amazing line up thought leaders are joining us this year! This a community subgroup for presenters that contains important information including our presenters' checklist: http://goo.gl/sGNSb. This is a direct link to the chat room that you see on the front page of our conference community web site. You can ask questions here or in the virtual conference lounge. Drop into our virtual conference lounge if you need help or have questions. Requests for certificates must be made by December , 2014 and will be posted by January 1, 2015. Directions must be followed precisely. If you have having technical issues, please refer to this documentation and browse Blackboard Collaborate's support portal: http://goo.gl/14dTNX. 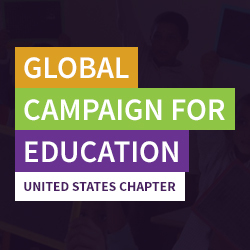 The Global Campaign for Education US Chapter is a broad-based coalition member organization working to ensure all children have access to a quality education.